Vine is a new player in the smart thermostat space with a growing startup behind it. A new challenger approaches! 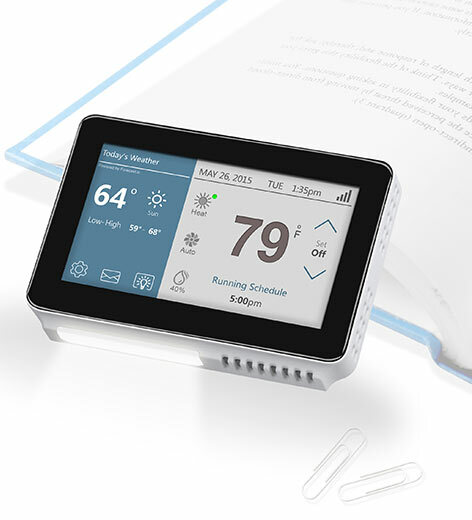 Vine Smart WiFi Thermostat from Xing Connected Corporation launched just a few months ago (summer 2016) at a reasonable price point with a robust feature set. The affordable alternatives to the most expensive smart thermostats are getting better all the time. Vine is yet another entry in the “around $100 or so” smart thermostat bracket, and unlike its direct competition, it has a full color screen and a twist dial. It’s more like a smartphone embedded in the front of the thermostat. The knob on the right is a twist dial, so you don’t have to worry too much about your accuracy on a touch screen for simple things like raising and lowering the temperature. Vine is new on the market, but I had an opportunity this month to email with its team about Vine’s features and share the details here. It’s worth pointing out that most of these “pros” are present on competitor thermostats as well. 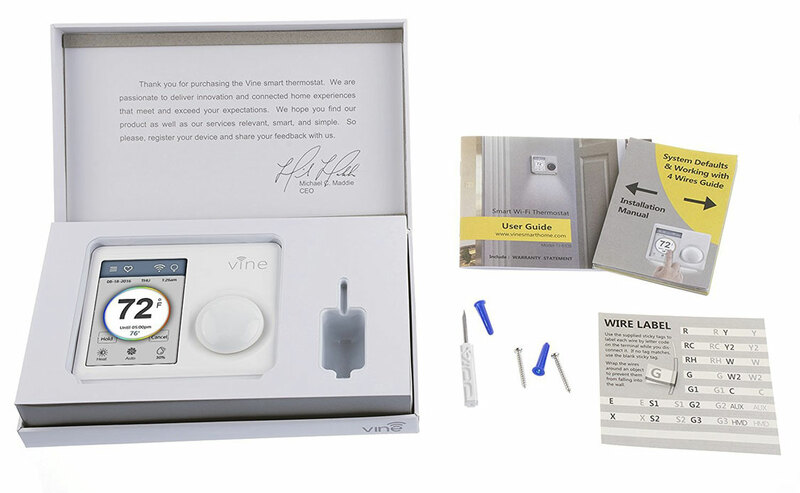 If you’re looking at the Vine thermostat on Amazon, you’ll notice that many of its reviews state that they were given the opportunity to purchase the Vine thermostat at a discount “in exchange for an unbiased review”. This is common for a new product – Vine is reaching out to reviewers (this site included) to drum up interest in their product. Vine’s got the basics covered, with more getting added regularly (usage reports and geofencing are recent additions). 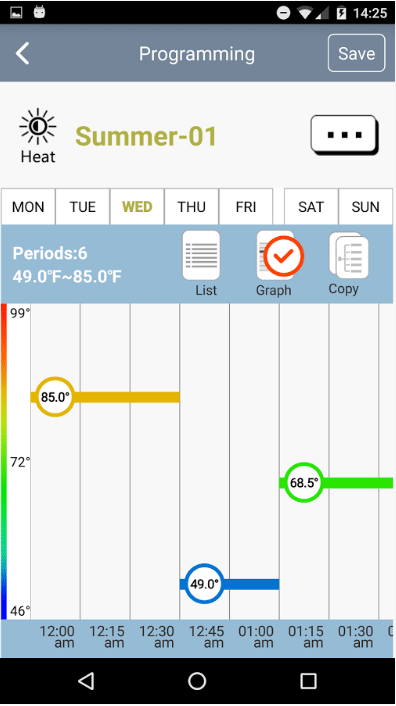 You can schedule up to 8 periods a day – many thermostats just offer 4 (that’s 8 separate times at which your programmed schedule can raise/lower the temp as you like). The touch screen gives you control over the unit from the device itself, and the physical dial appeals to users who want a simple “twist to adjust” experience. A mobile app is available for both iOS and Android, and a web portal. The nightlight along the unit’s bottom edge is a unique feature among smart thermostats, and you can even schedule it. In this price range, the Vine’s primary competitors are the Emerson Sensi and the Lux Geo. Vine’s advantage here vs. these other two thermostats is its fully-featured color touch screen. However, Vine does not offer a solution to 2016’s most vexing smart thermostat problem: what to do for systems lacking a C-wire. Alas, the Vine smart thermostat more or less requires a C-wire. We point this out because the vast majority of of Smart Thermostat Guide’s traffic arrives via search queries for help with a missing C-wire and info about thermostats that don’t require a C-wire. 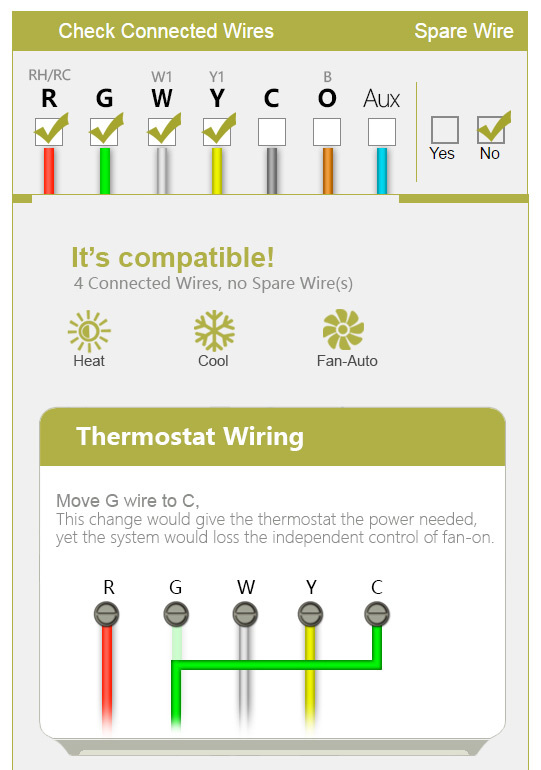 To check your wiring against Vine’s requirements, the Vine website has an easy-to-use wiring compatibility tool. Like all “smart thermostats”, Vine offers an iOS version and Android version of its app for controlling the thermostat from anywhere in the world. You can also set up schedules, override the current schedule, and do general maintenance tasks on your thermostat (like setting up service reminders). We love seeing a regularly updated app, and both the iOS and Android versions have a recent update at the time of this writing (September 30, 2016). You can also view hourly or 5-day forecasts, and there’s a humidity report included. Most thermostats (programmable and smart) limit you to just 4 adjustment periods per day. Presumably, 4 periods per day is intended for a family or person who wakes in the morning, goes off to work/school, and returns in the evening: raise the heat in the early morning, turn it off in the late morning, raise the heat again in the early evening, lower the heat in the late evening. With 8 adjustment periods per day, the Vine thermostat is better equipped for a “non traditional” schedule. If you regularly come home for lunch, for instance, you might like being able to program an increase in temperature for your mid-day return. Vine is the only smart thermostat on the market with a built-in nightlight in the bottom of the unit. You can schedule it and it has 4 levels of brightness. Depending on where your thermostat is located in your home (and how often you walk by it in the middle of the night) the nightlight could be a useful way to add illumination to a hallway or area that is otherwise dark at night. Vine can be programmed to remind you when to change filters and when to service your furnace and/or air conditioning unit. Vine can track your location and kick off a scheduled behavior as you approach or leave your home. Vine is compatible with traditional 24 V furnace systems in the US and single-stage heating/cooling systems. Don’t use it with line voltage systems (thick red/white wires) and don’t use it with multiple-stage heating/cooling. Wait, what’s this other Vine thermostat? The TJ-919 is an upcoming Vine product. It’s on their website, but it’s not actually for sale yet. An earlier version of this Vine thermostat review contained more questions than answers. The company reached out to me and set the record straight on a number of features and compatibility questions I wasn’t able to find answers to on my own. It’s great that the company is trying to get the Vine into consumers’ and bloggers’ hands, because the major tech sites haven’t picked it up yet and it’s just getting started collecting reviews on Amazon. You can learn more about the Vine at the company’s Facebook, Twitter, and Instagram. The market is getting saturated at all price points from under-$100 to upwards of $250. Vine’s catching up with recently added usage reports and geofencing, and the touch screen is a nice extra not normally found at this price point. 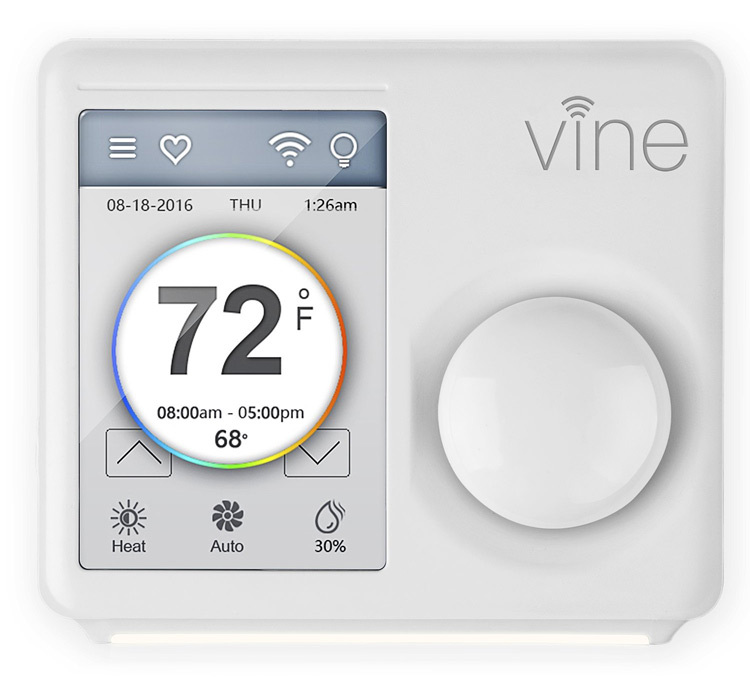 Unlike some WiFi thermostats in its price range, Vine requires a C-wire, so keep your wiring in mind when choosing a thermostat. Overall, Vine is a solid entry into the “budget smart thermostat” category. If you have a Vine and you love it, please let us know in the comments! Previous: Previous post: Which smart thermostats are compatible with Alexa? Hi all, I currently work for Vine and would love to share some internal insight as to why we recommend and believe in our product. First off, I’d like to thank the reviewer for taking the time to analyze our brand and give us some publicity! I’d also like to mention that I installed the Vine 610-B Smart Thermostat in my home about two months ago, so I’m quite familiar with the user experience one can expect. At an MSRP of $129 with all standard smart features, I believe our product has a competitive price advantage compared to our competitors. Our thermostat (model 610-B) has a resistive touch screen that’s very responsive along with a traditional control dial for easy accessibility to all potential users. Setting up a programmed schedule is easy with up to 8 periods per day. No other thermostat at this time that we know of has a nightlight feature with scheduling options, just in case you need to get out of bed in the middle of the night. Other features includes a programmable fan, weather forecasts, system lock/unlock, system limits and alerts, and App/Web Portal accessibility. If I may say so myself, I believe our App has one of of the best APIs in the smart thermostat industry and is both fun and intuitive in its functionality; I love being able to control the thermostat remotely from the App. The reviewer mentioned vine thermostat has a geofencing (gps) feature. I have been unable to find this feature. Please help me find it (or correct your review). Thanks! If you go to the application, before you click on your device, thermostat, click on the person top left corner. You will see an option for “location,” click on that and it will locate you. It took a few tries to get it to go through for me. It seems the application may time out nanoseconds before the location completes. This is an issue I forgot to put in my review. Now, how to actually use that location in programming, iam not sure. I’ll have to play around with it and see. Perhaps it goes off the Comfort zone setting (the heart icon) and when you approach home, it activates. I would contact customer support. As it is, I will probably never use it, as the programming is sufficient for me. We’re currently working on implementing the Geofencing feature with programming capability; it should be available within a couple months via an automatic remote update will administer. For the thermostat to remember your location, simply add it to the Vine Smart Control App while it’s connected to Wi-Fi. You can view the location linked to your thermostat by selecting Date & Time from the System Menu or by selecting Location from the User Profile Menu. Make to sure allow the App to use your location when opening the App for the first time or turn on location access for the App under Settings on your mobile device. Contact info@vineconnected.com or (800)264-3457 Ext. 3 if you need further assistance. Installed this yesterday in about 15 minutes. The day before I ran an extra wire for the C connect (basically a 24 volt line). That took a bit over an hour, well because let’s face it, you never know know what’s in those walls that can hinder you. I ran this wire to keep my fan option open, although I think in the past 2 years I’ve used it once. So really this isn’t as big a deal to most I believe. I purchased mine from Amazon after careful review of others, Honeywell, emerson and others. This one had the most features. It also is a new player, I like that because the company has, as it should, a hunger to satisfy being so young. I have only one qualm about my experience with setup: the requirement to register before using WiFi or the application. When I tried to register in chrome on my LG G5, I received server errors, the same with Windows 10, and the same with the Droid app. However, seconds after I sent an email explaining my experience, I tried it once more and it went through. Call it a fluke or server maintenance what have you, for an hour it didn’t work and then it did. (Yes, my wifi was working and verified as such) So I really can not blame them, as I have had issues regarding server providers and the uptime they claim and the uptime you actually get. Perhaps they should get a different server provider if this becomes problematic. It has not, however, been that yet. I like the app and options. I would like to see: ability to program winter/summer without actually having that program activated in the application (droid). Easy setting to change the temperature variation. When the thermostat kicks on, under 3 degrees on, over 2 off etc. I purchased this thermostat on my own accord and did NOT receive any rebate or discount for reviewing this item. But iam still just as happy with this unit and wish I had received a discount! Even though it was reasonably priced. I would recommend this thermostat to anyone looking for a smart one. I will post updates if and when my experience changes. Iam hitting customer support only because I have not heard back from the email I sent about 16 hours ago on Sunday. Thanks for the positive feedback Craig! Hi, just installed my 2 new devices. Couple issues with the “Weather Forecast”, does not work despite set up the location several times. Please, Anybody can help me how to set up the Temp range when the system must turn on and off to keep the desire temp. I have the same issue, the temperature fluctuation is too great. From cold to way too warm. I’ll do a temperature study and report on the fluctuation soon since I just installed it, but its too great and would like to change it. Also is there a calibration function? I have a calibrated thermocouple and would like to set this according. Thanks. Where is the integration with Alexa, Google Home or any of the Smart Home Hubs? Hi, I too have a 610B-W and it produces heat instead of cooling. How do I correct this? From other reviews that I have seen and my personal experience ,it does take a few tries to connect to your Wi-Fi, the server, and register your unit. After all was setup, I had no major issues. My wife mentioned to me that she felt the temp. reading was off so I pulled out my temperature readers and placed them around the room. With any house and room the temperature will be different at different locations. But I did notice that the temp was off by about 1-2 degrees, thank goodness for the calibrator. I made the adjustment and now I get an accurate reading. I have read that others have been able to connect to Alexa, but I have not seen the official app on Alexa and those that I have seen have bad reviews. I will wait until they advertise it on the website. In addition they say it can act as a hub for IOT, I wish they would elaborate a bit more on this as others may not know what that means or may be confused about it, including myself. I am familiar with Wink, Zigbee, and Samsung …so will this work with them? I bought this through Newegg and I do not regret it. For the price it does exactly what I want at a fraction of the cost as the big names. Installed the thermostat. It worked great for about a week or two, then the app lost the device ID. Signed into the website, same thing. My app says there is an update going from version 1.1.4 to 1.1.2. Don’t we version things in ascending order? I am working remote right now and the entire reason I bought it is so I could check the status of the house when I was away. Can’t reconnect the device without being there to get a confirmation code off of the device. Overall happy, but flossing connection and memory of all necessary data to reconnect remotely is not desirable. Also, suspicious of update notification wanting to go from 1.1.4 to 1.1.2.